There is something moving about seeing peace between two ancient nations in modern times, that is exactly what took place Sunday at a ceremony in Jeddah, Saudi Arabia. King Salman oversaw the agreement between officials from both Eritrea and Ethiopia bringing an end to more than 20 years of war between the two countries. 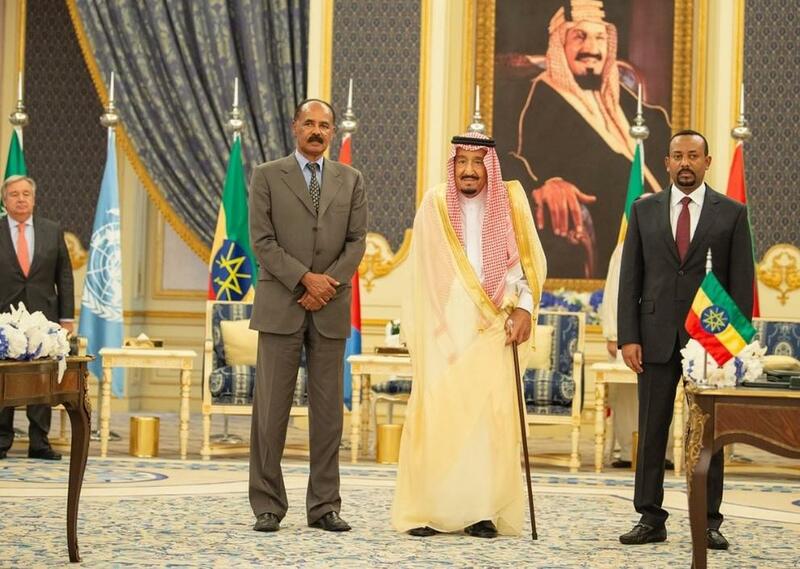 Saudi Arabia's King Salman presided over a ceremony between Eritrean President Isaias Afwerki and Ethiopia's Prime Minister Abiy Ahmed after the two leaders signed the agreement. Even UN Secretary-General Antonio Guterres described the ceremony as a "historic event." The General said in a statement, "I want to express my deep appreciation to the role played by His Majesty the Custodian of the Two Holy Mosques (King Salman) and by the government of Saudi Arabia for facilitating this agreement and contributing to bring together the parties." The UN chief also gave his nod of approval and paid tribute to "the courage, the vision, and the wisdom of the prime minister of Ethiopia, who had the capacity to overcome the resistance from the past and open a new chapter in the history of his country, and also the way the president of Eritrea responded to his peace initiatives." He added in conclusion, "This means that there is a wind of hope blowing in the Horn of Africa." The mention of Africa is becoming more frequent with the beginnings of a modern racial genocide brewing in the southern part of the giant continent where white farmers are being persecuted. The persecution of the farmers has led to fears that the disruption of South Africa's farmers could even lead to vast food shortages in the future years down the road. King Salman and Crown Prince Mohammed bin Salman were credited by Saudi Arabia's Foreign Minister Adel Al-Jubeir for bringing the two countries together. Al-Jubeir said at the ceremony, "The Jeddah Peace Agreement signed today before the CTHM is a historic milestone for the peoples of Ethiopia and Eritrea and will contribute to strengthening security and stability in the region at large." The Order of King Abdulaziz was presented to the two leaders to honor them by King Salman himself. The two countries fought a raging war from 1998 to 2000 over a border dispute that ultimately left tens of thousands dead. The conflict came on the heels of a previous war for independence against Ethiopia that led to Eritrea to fight for its freedom in the early 1990s. Both countries finally signed an initial agreement in July and this Tuesday saw the land border crossings reopened that had previously been shut for 20 years. The ceremony included many influential royal figures including Saudi Crown Prince Mohammed bin Salman and UAE Minister of Foreign Affairs and International Cooperation Abdullah bin Zayed Al-Nahyan. Both Ethiopia and Eritrea brought a host of their own dignitaries to the ceremony. King Salman initially welcomed both Afwerki and Ahmed at the Peace Palace in Jeddah early Sunday. They all then attended the official reception ceremony where all three nation's national anthems were played. Things seemed to go well with King Salman accompanying Afwerki and Ahmed to the Royal Reception Hall at the Royal Court. Next, they shook hands and embraced with other Saudi royals and officials. The group spent nearly all of Sunday together with a luncheon following the introductions. King Salman also received Secretary General of the United Nations Antonio Guterres earlier that day in his office at the Peace Palace in Jeddah. The ceremony hosted a vast number of influential figures from all three nations, and they reviewed developments in the international arena as well as mulled over various approaches toward achieving world peace. Some of Saudi Arabia's most senior officials were present including Minister of Interior Prince Abdulaziz bin Saud bin Nayef, Foreign Minister Adel Al-Jubeir, and the Kingdom’s Permanent Representative to the UN Abdullah Al-Maalami.